There is a great forum at the eevblog, which is very long and detailed. Â Many people are having trouble with figuring out which way works to generate the keys as it changes depending on if you have the DS2072 or the DS2072A model, and also some of the newer firmware versions do not allow downgrading of the firmware. For DS2072, both are very easy. Â The serial is printed on the back, and the private key isÂ 8EEBD4D04C3771 (the same across every one). Â Rigol got wise and started changing the key in the 2072A series, so you need to get your private key. The easiest way is posted thanks to a handy screenshot utility (Original Forum | Link to the screenshot utility). 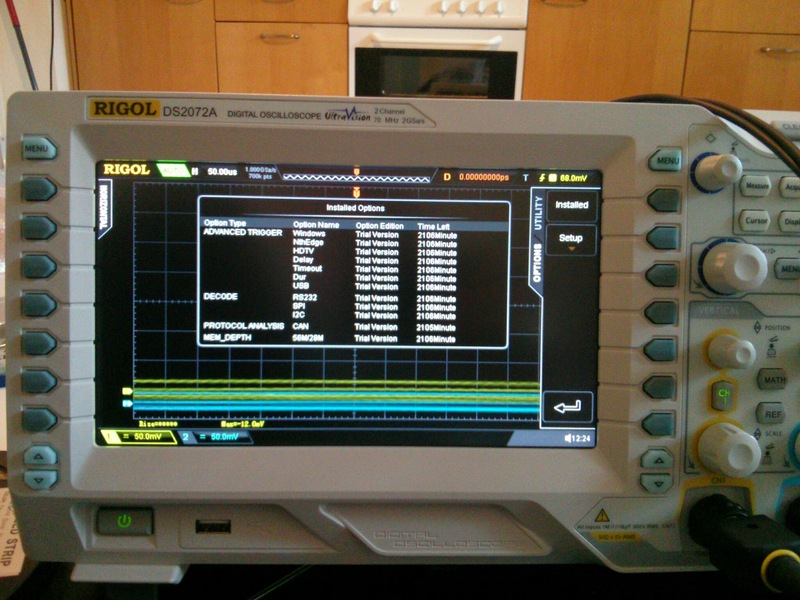 Â This utility needs a config file (Original Forum | Direct Link) to be able to save the 32M memory dump, and you’ll have to enter the IP address of the oscilloscope into the utility so it can do screenshots over the network. Place the config in the Resources folder, then do a Device -> SCPI Command. Â Enter the following command and click “Send + Receive” — thisÂ will take about 5 minutes to dump 32Mb. Â Save the file when complete. Entering the 300MHz key worked on my scope!